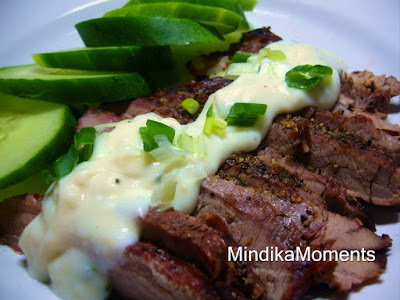 Mindika Moments: Summer grilling goodness!! I love my grill. I can't imagine cooking without it. I grill all year round...rain, snow or shine. But I especially love grilling in the summer. Summer farmers markets and fresh garden veggies are perfect grilling companions. Tonight we grilled some yummy flank steak and I made a...believe it or not...healthy blue cheese cream sauce to go over the top. We paired it with some fresh cucumbers from my neighbor Iliana's garden (Thanks Iliana!! They were delicious!). 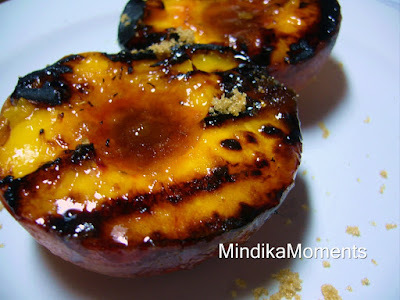 Then I took some yummy fresh peaches and grilled them up with some butter and brown sugar. It was so good, I was sad when dinner was over! 1. Make 6 shallow crisscross slashes on the meat. Rub meat with about half the pepper. Make 6 slashes on the other side of the meat. Rub with remaining pepper. 2. Spray your grill with cooking spray. 3. Grill the steak for 6-8 minutes on each side, or until desired doneness. 4. Meanwhile, for the sauce, melt the margarine in a small sauce pan over medium heat. 5. Add the garlic and green onions; cook for 1 minute. 6. Stir in the flour, and then stir in the milk all at once. 7. Cook and whisk until the sauce thickens. 8. Add the chicken stock and blue cheese and cook for additional 1-2 minutes until the cheese has melted and the sauce is well blended. 9. To serve, thinly slice meat diagonally across the grain. Serve with sauce. 1. Wash peaches and slice in half. Remove pit. 2. Dip each peach half in melted butter and then in brown sugar. 3. Place the peach flat side down onto the grill. Allow to grill for about 3-5 minutes depending on the size of the peach. 4. Remove from grill and sprinkle with additional brown sugar. *Be sure to clean your grill very well before cooking the peaches. I kind of forgot tonight and our peaches had a slight smoking hamburger flavor. My bad...! Funny enough, they were still delicious!